I haven’t reviewed a product on this blog for some time time. It’s not that I don’t enjoy writing about products, but I find other bloggers do it a lot better. But occasionally, I come across a product that I enjoy and want to tell you about it. That’s the case with rdio. My short review is this: If you want access (web or iPhone/iPod Touch, Blackberry, and eventually Android) to a lot of music in a simple to understand and easy to use web service, then rdio is well worth the $5 or $10/month subscription fee. Rdio was created by the founders of Skype, and their desire to keep the UI clean and simple is apparent the first time you login. I’ve used Napster, Rhapsody, and Zune Pass before, and although each had a feature or two that caught my attention, none of them held my interest for more than a few months. I’ve been a heavy Last.FM user for the past few years. It’s a great way to discover new music. But there are times when I want to listen to an entire album and Last.FM and Pandora are not able to do that. My perfect service would combine the deep catalog of rdio and the serendipity of Last.FM and Pandora. But that’s for another post. Rdio does allow me to follow friends who also subscribe to the service and listen to their playlists as well as leave comments on them. That helps me discover new music, but I hope one day they allow me to add stations based on my collection. For example, if Rdio knows I like Chris Botti, it might create a station of similar artists including Till Bronner. Rdio does show “similar artists” and “inspired by” which helps in discovering new music. For example, when I click on Pink Floyd, rdio suggests I might like The Moody Blues, Yes, Queen or Peter Gabriel. That sounds about right. I should mention that rdio allows me to create a collaborative playlist. This didn’t sound very useful to me at first. But I recently came across a scenario where I believe this feature would be of great value: Say I like the song “Watercolors” by the Postmarks, yet I don’t know a lot about the group or its influences. I could create a playlist with one song and allow my friends to add their recommendations to that playlist. When you first login to the service, rdio asks for your permission to scan your iTunes library whereby it will create a collection based on the music you own which can be found on rdio. My music tastes trend toward classic rock and jazz, and rdio was able to match over 90% of it. To be clear, rdio does not take your collection of mp3s and upload it to their servers. 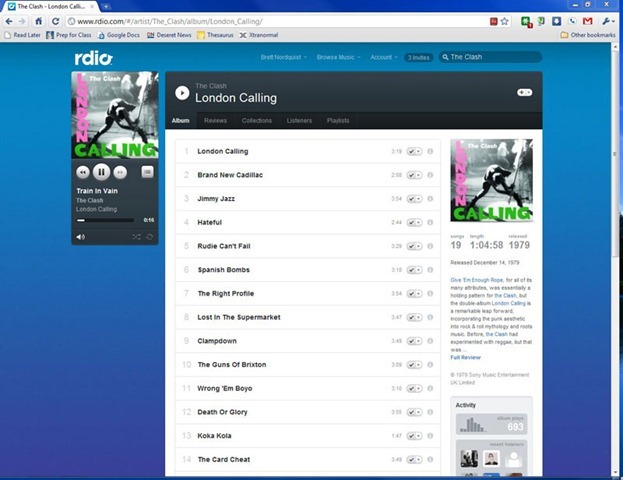 It merely tells you which artists and albums of your current collection can be streamed from rdio. This is a helpful starting point until you’ve created new playlists from the rdio website. The picture below shows how rdio allows me to see what’s popular among my collection, my friends or all subscribers. Or you can find an artist, such as the Clash, and play any song or album. Rdio makes it easy to create a playlist like I’ve done below. Or you can queue up songs to play as you navigate through the service. Again, the focus is on ease of use. 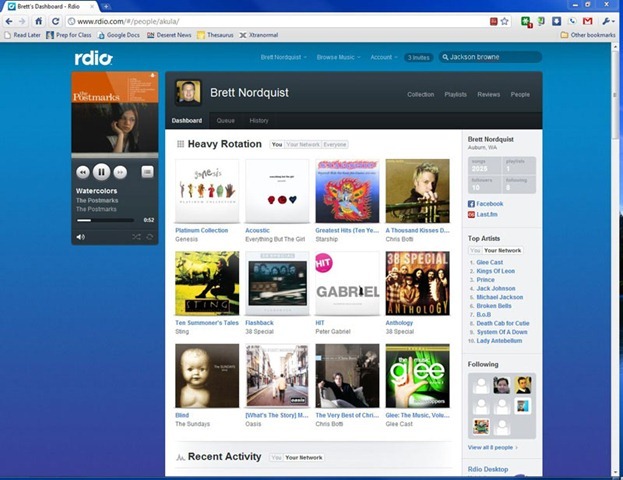 Rdio does not include as many tracking metrics found at Zune or Last.FM. 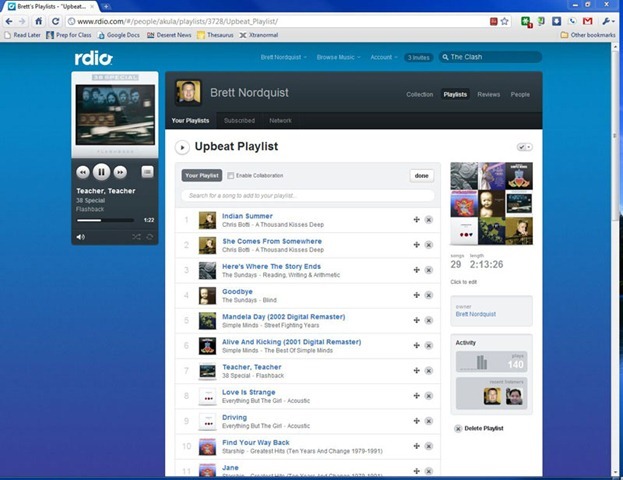 I’m sure many of the social features of rdio will be fleshed out over time as the service moves out of beta. As of today, you’ll need an invite in order to use rdio. I was able to test drive the service for about 20 days before deciding to pay the $5/month subscription fee. Another $5/month allows you to stream to your mobile device. The service is not perfect. I’d like to see better playlist management and it never hurts to add more artists. I’m certain their library will continue to grow with the service, but it’s already quite good. But I’m absolutely hooked on rdio. I listen to it while working at the computer at home as well as at work. It’s decreased the amount of money I spend at the Amazon MP3 store and iTunes. Also, I find using iTunes an exercise in frustration, but necessary evil which accompanies my decision to own an iPhone. Yet rdio feels modern and is a lot of fun to use. Most competitors charge $15/month. Rdio is $5/month for web streaming and $10/month for web + mobile devices. Obscure music tastes may not be a good match until catalog grows. If you’ve made it this far and would like to test drive rdio, leave a comment and I’ll email an invite to the first three. If I can convince rdio to give me more invites, I’ll hand those out as well. Update: @kgoyette showed me that rdio does allow one to create stations based on an specific artist. Click on any artist and off to the right you’ll see “Artist Radio” which plays songs from artists in the “similar artist” section. Awesome! Sounds interesting, can I get an invite? Sure, can you send your email to brett@nordquist.org? I didn't see your email in your profile. I tried out the trial and really liked it, but not enough to pay… mainly because I'm pretty happy listening to my existing music collection, and too many of the “I wonder if they have…” questions I had about music I wanted to try were answered with “no”. My tastes run close to mainstream in classic rock and Jazz so I've not come across many albums/songs that aren't available on rdio. But I've heard hear that those with more eclectic tastes might have to wait until rdio is able to license more libraries. I too enjoy listening to my current collection, but it doesn't expose me to new bands or songs I wouldn't have heard otherwise. Admittedly I’ve never been sold on any of the music discovery sites… most of the new music I’ve bought in the last 5 years I’ve heard via the DJ at radioparadise.com.